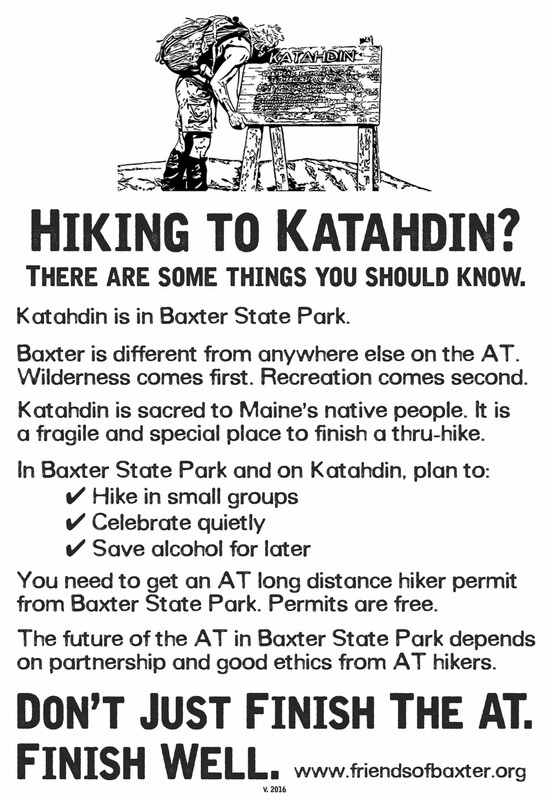 For over 80 years, Katahdin has been the northern terminus of the Appalachian Trail (AT). 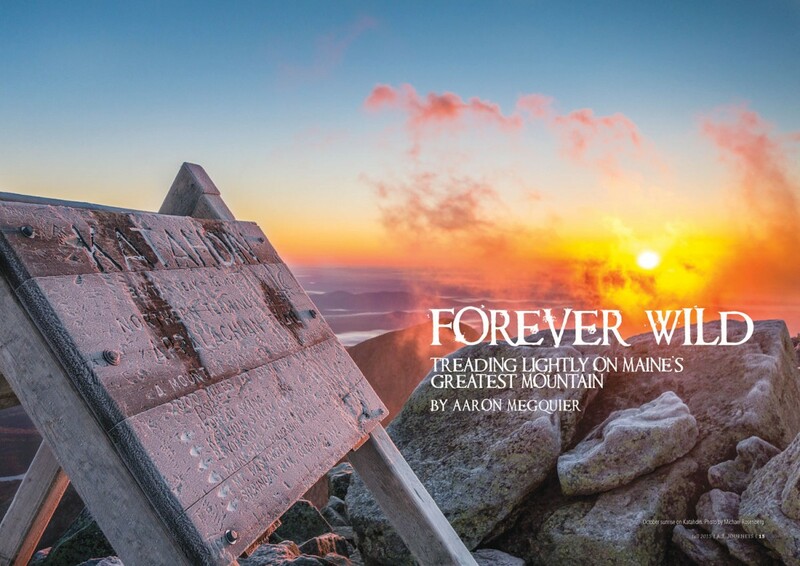 Reaching the summit of Maine’s greatest mountain has taken on a near-mythical significance for northbound thru-hikers. The vast majority of thru-hikers celebrate the end of their 2,185-mile journey responsibly, with a sense of reverence for a very special place. A small but growing number of thru-hikers are finishing the trail in a way that negatively impacts the Park's wilderness values, as well as the experiences of other visitors. This behavior is threatening the future of the AT in Baxter State Park. Friends of Baxter State Park is working to resolve these issues in a constructive way. On July 21, 2015 we hosted a meeting that included representatives from Baxter State Park, the Appalachian Trail Conservancy, the Appalachian Long Distance Hikers Association, and the Maine Appalachian Trail Club, as well as local business owners and members of the thru-hiking community. Our goal was to work together to find positive, collaborative solutions to the problems Baxter State Park is facing related to AT thru-hikers. As a direct result of that meeting, Friends launched an outreach campaign in early 2016 with the goal of encouraging thru-hikers to finish well on Katahdin. We are using a variety of tools and messages to carry out this campaign, which are described in greater detail below. In an effort to encourage good thru-hiker behavior in the Park, BSP staff developed three basic messages for thru-hikers: celebrate quietly, hike in small groups, and save alcohol for later. Friends printed 1,000 waterproof stickers of each design at 2" x 2" in size - just right for a water bottle. We've distributed over 2,000 of them to thru-hikers so far at Trail Days in Damascus, VA and through our partner organizations. In spring 2016, FBSP developed a poster with guidelines for AT thru-hikers on how to finish well in Baxter State Park. We printed an edition of 500 posters at 13" x 19" in size, and distributed them to hiker hostels, gear shops, and our nonprofit partners along the Appalachian Trail. Posters are on display at the Appalachian Trail Conservancy’s Visitor Center in Harpers Ferry, as well as multiple locations in Baxter State Park. In May 2016, Friends attended the Trail Days festival in Damascus, Virginia. This three-day event is the largest annual gathering for the AT community, and reportedly the largest hiking festival in the world. Over the course of the weekend, we had one-on-one conversations with about 1,000 people who visited our booth. Many of these were current thru-hikers with questions about finishing on Katahdin. Friends also gave a presentation on Friday evening to a group of about 50 people. Many thanks to our friends at ALDHA (the Appalachian Long Distance Hikers Association) for inviting us to Trail Days, and graciously hosting our table in their tent. 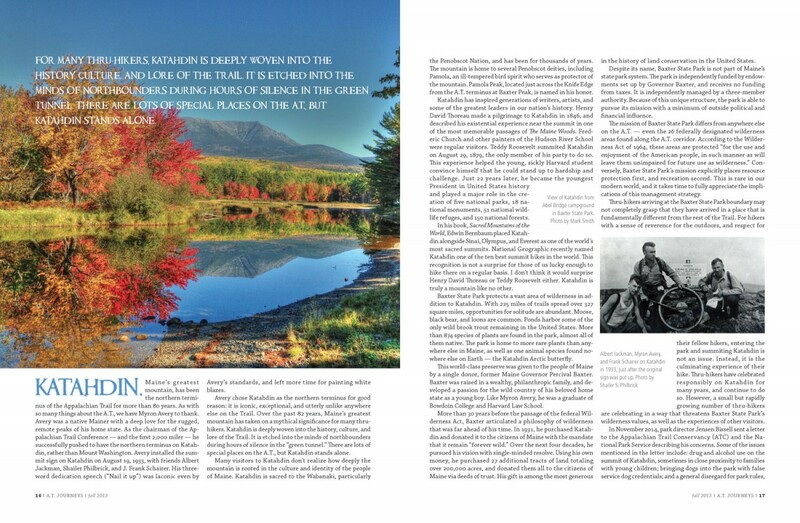 In fall 2015, following a summer of international publicity about thru-hiker behavior on Katahdin, Friends was invited to write a feature article for AT Journeys magazine. 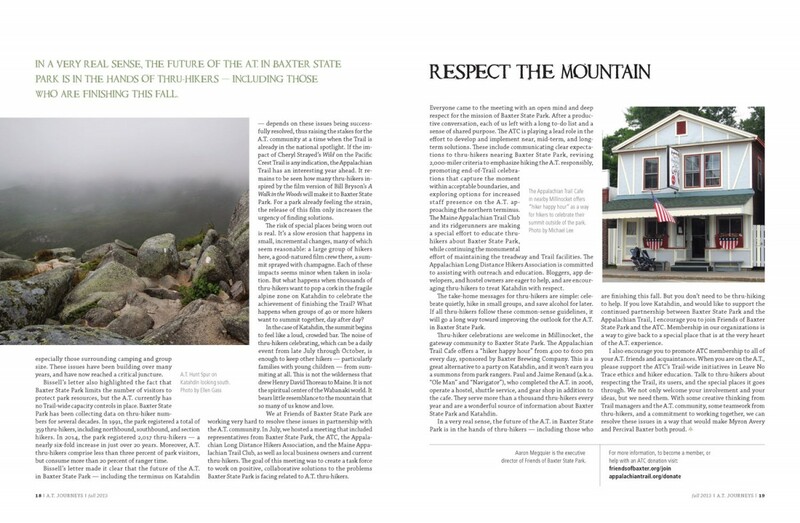 This is the member magazine for the Appalachian Trail Conservancy, with a circulation of about 45,000. We focused on educating the AT community about why Baxter State Park and Katahdin are different than anywhere else on the trail, and positive steps that all hikers can follow to reduce impacts on Katahdin.